I had a shopping spree during the Thanksgiving, Black Friday and Cyber Monday promotions! There are so many shops and stamp companies offering discounts and promotion during these period. Thus, I quickly grab these chances to save, replenish and also fulfill some of my long list of wishlist. Jennifer McGuire has a one-stop-sale-post on 26 November 2014 that listed down all these fun shopping and discount codes. She lists down lot of shops and stamp companies that having these Thanksgiving, Black Friday and Cyber Monday promotions. One of the shops caught my eyes as I never heard it before, Butterfly Reflections Ink which offer 30% off entire shop. The discount is attractive but I am not sure what kind of shop it is - one-stop-shop or a stamp company. Well, to find out, I just click on the link that Jennifer supplies. It is an one-stop-shop like Simon Says Stamp. Although Butterfly Reflections Ink products might not be as many as Simon Says Stamp, most of the stamp brands that I been keeping eyes on are sold in this shop! Its price also is slightly cheaper than the Manufacturer Suggested Retail Price (MSRP) and with that 30% discount off the entire shop, it is a good discount and saving for me! The best thing is that shipping fees is at flat rate of USD10 for First Class with orders consisting of stamps, dies and stencils only! This is just fabulous as these three (3) things are the many things I always buy! 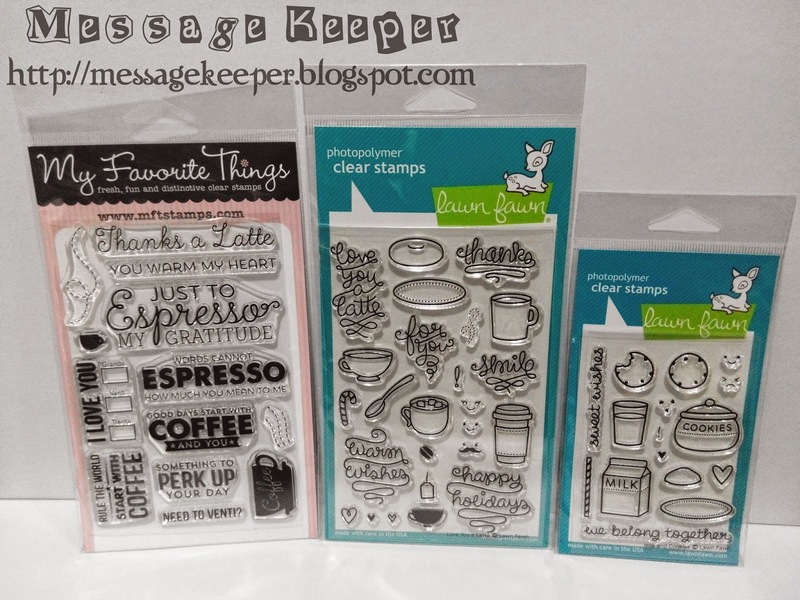 I quickly browse through the Lawn Fawn section as I have two (2) sets of stamps that I been dying to have for months, the Milk and Cookies and Love You a Latte and their matching Lawn Cuts. They are in stocks and without much consideration, I just click 'Add to Cart'. Since I got my Lawn Fawn wishlist fulfilled, I browse through other brands and ended up with more things on the cart. Like usual, I did not immediately paid for the items as there are so many shops and stamp companies offering discounts and promotions. I need to weight out my best options. Then, I wander to Taylored Expressions (TE) website as they are also having Black Friday Sale with 30% off everything in stock for 24 hours only that begin on 27 November 2014! I been eyeing some of TE's products for some times now. 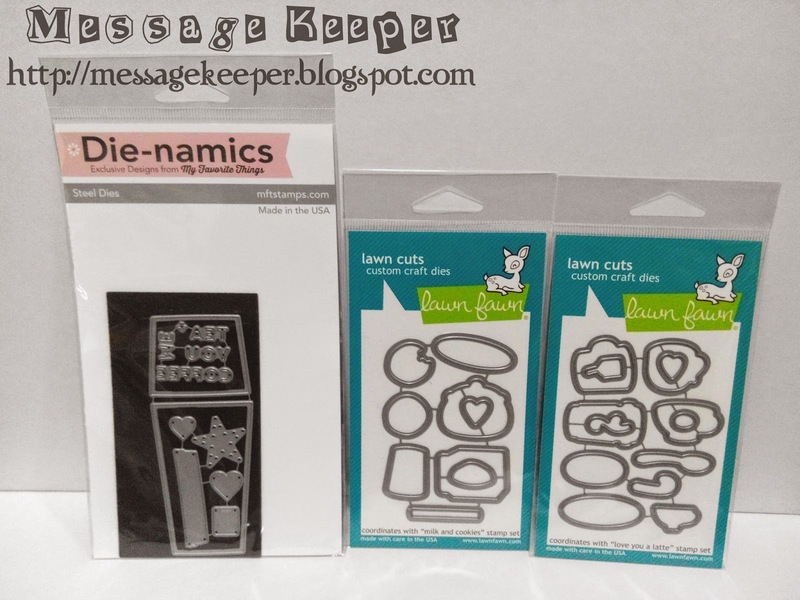 However, due their pricing (because their stamp is not clear stamp but pre-trimmed red rubber stamps mounted on cling foam) and not many retailers carry their products, it is quite hard for me to get their products. But this time, I am not going to miss out this Black Friday Sale of their's. 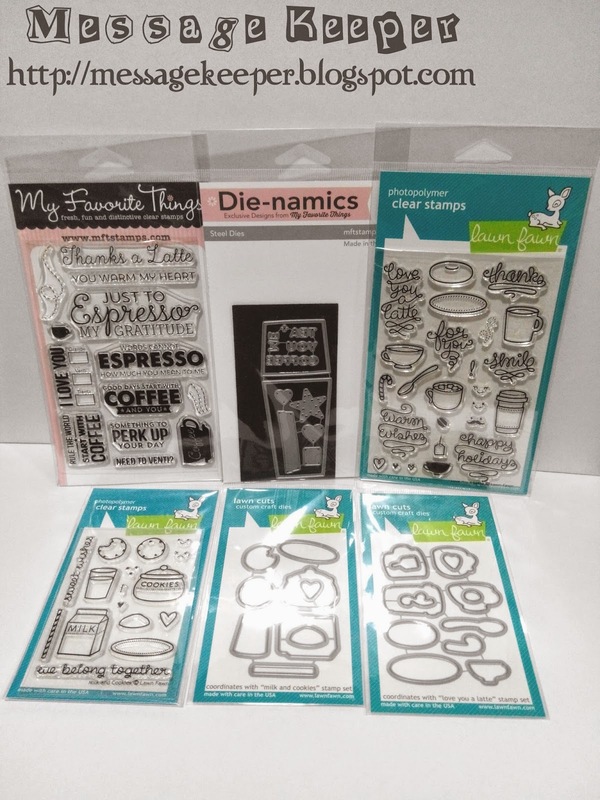 Although Butterfly Reflections Ink do carry TE products, the stamp sets and dies I want are not in their store. As I browse through TE products, I just keep adding the items I want onto the cart without thinking. That is one way of my online shopping style and by the end, I will just re-think again on the items on my cart and delete whatever is not necessary. Then, I wander to other shops and do the same style of online shopping. In the end, after calculating the total amount I need to pay and the currency exchange rate, I am way out of budget! The amount is so huge that it scared me and without much though, I discard the 'not-so-must-have-items' from various stores and re-calculate. However, the amount is still way out of my budget. Then, I discard again until three (3) stores left, Butterfly Reflections Ink, TE and Simon Says Stamp which already caused me a hole-in-my-bank-account. I ended up buying the most from Butterfly Reflections Ink because of the variety of stamps and dies I can get with great discount (I saved more than USD20!) and most importantly, cheap shipping fees! For TE, I ended up buying one (1) dies only as I put most of my dollar to Butterfly Reflections Ink and Simon Says Stamp. I made all my payment on the same day, 29 November 2014 (Malaysia local time). I got Butterfly Reflections Ink shipping notification on 02 December 2014 but the date on the package is 29 November 2014 instead. The next day, TE sent in their shipping notification and the date on the package was 02 December 2014. Anyhow, the most important is that the packages arrived safely to my hands and thanks to my dearly husband for picking them up at the post office early in the morning today. I am so glad that Jennifer introduces Butterfly Reflections Ink and I definitely will come back when there is a sale on as their shipping fees is just so irresistible. :P Actually my this time shipping is costing more than USD10 as stated on the package which is USD10.94. On the invoice, Vanessa, owner of Butterfly Reflections Ink has also noted this. Beside the slashing on the shipping, she also written some thank you note in the same purple ink and have a mark beside the items I bought which I believe is checklist mark on the invoice. Oh, yes! I almost forgotten about one (1) unexpected item that I got from TE. It is the 'Thanks' dies as shown above. 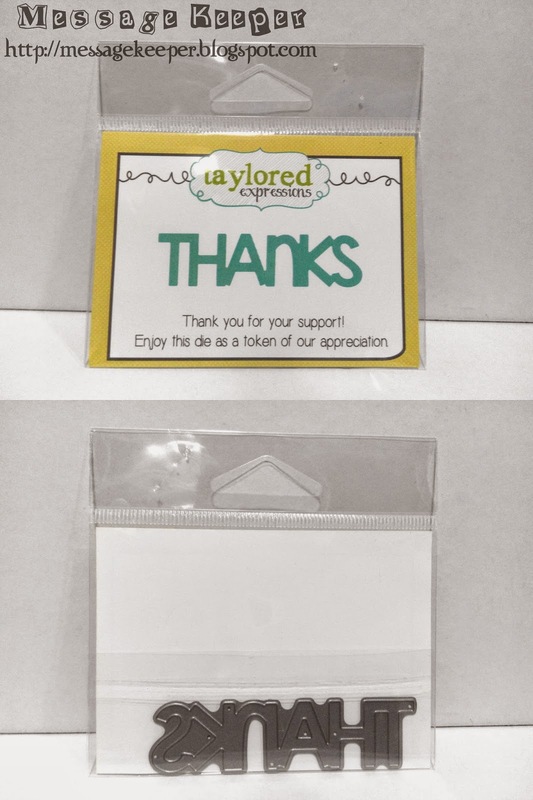 It is stated that TE gave it away as a token of appreciation for the customer's support! It was stapled on the invoice on the right upper corner. Same as Butterfly Reflections Ink, TE also had hand written thank you note in blue ink and checklist mark on the invoice. How nice of TE to include the 'Thanks' dies and it is really useful for me as I been thinking to get one but now, it seem there is no need. I even can save up that budget for another thing! I am just happy and glad! 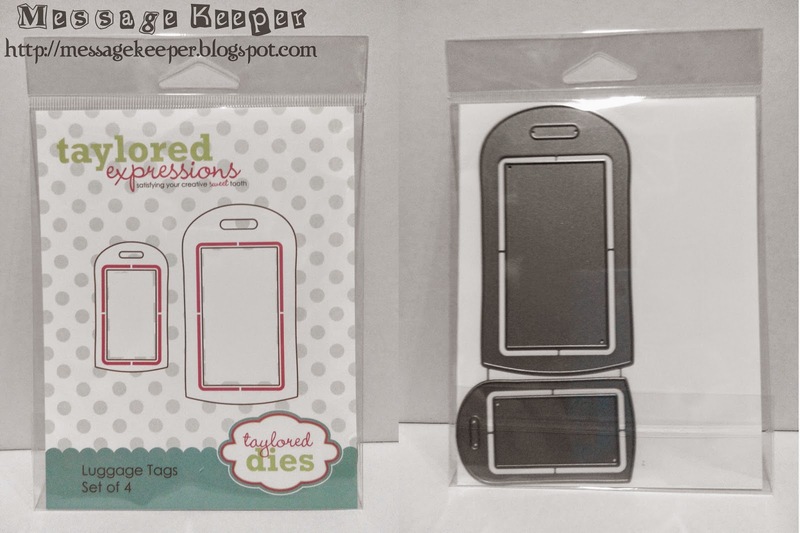 Now, off to play with my new toys and hopefully I manage to make a luggage tag for my best friend as Christmas present.